Most Brands Use Data Incorrectly When Trying to Be Creative. Here's How to Avoid the Issue. — Jay Acunzo | Author. Speaker. Maker of Shows About Work. In the digital age, we can measure everything. We can measure clicks and views and how many of those views were unique. We can measure exit pages and bounce rates and conversion funnels. We can measure CPC and CPM and CPA. We can measure (extremely Chris Traeger from Parks & Rec)LITERALLY everything. And because we can measure LITERALLYeverything, we find ourselves buried in data. This can both help and hinder creativity. The difference? Are you "Aristotelian" or "Galilean" in your approach to data? In our quest to create exceptional work, we'd be wise to understand both approaches to using data. We'd be even wiser (I'm talking owl with a graduate cap on his head-level wise) to use one of the two in our work. Up first, we have the approach espoused by Aristotle and his followers. A-Stots believed the world was best understood by first seeking theessence of things (what we might call absolutes). According to this approach to data, the more we gather information about something, the more we can update our understanding of all versions of that something. We strive to get closer and closer to understanding THE truth. In this way, your brain becomes a sort of filing cabinet. The more we learn about things that exist in the world, the more we can divide and subdivide everything into various categories. Then, when we encounter something that needs interpretation, we merely pull out the right drawer in this ever-growing cabinet in our heads. There are two glaring problems with this approach: absolutes (the “essence” of something) and the past (the filing cabinet). When we approach data with an Aristotelian lens, we plan tomorrow's actions by looking at yesterday's understanding of the world. We cling to absolutes, or as I like to call them, assumptions. In the modern workplace, where many of us face complex problems requiring creative solutions each day, it's dangerous to make decisions based on assumptions. That's where Galilean approaches to data can save us. Galileo pushed a more modern approach to the scientific method in his focus on testing variables. Whereas Aristotle sought to understand The Truth, Galilean approaches to data require us to seek A Truth. In other words, rather than make decisions based on assumptions, we test, learn, and iterate quickly based on the specifics. When we view data with a Galilean lens, we embrace that context matters most. Effectively, Galilean decisions emphasize on firsthand learning, not theory or precedent. Rather than gathering up all the information (absolutes) we need to justify acting, we act to find new information. 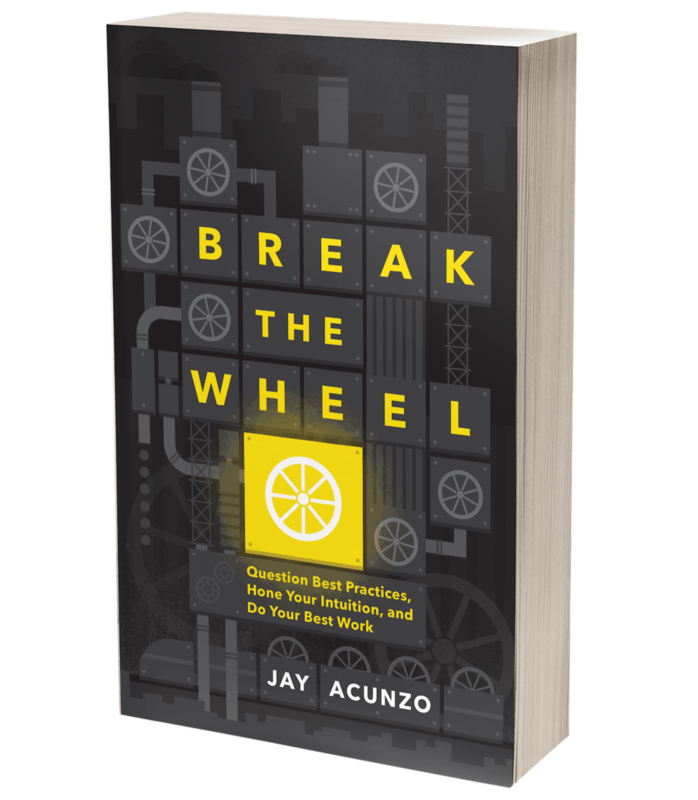 As I wrote about in my book, Break the Wheel ("Break the Wheel: The spectacular new book from Jay Acunzo. Get yours now on Amazon! "), it's possible to make decisions with greater clarity and even speed when we make one simple switch: Stop acting like experts and begin acting like investigators. This means we no longer start our thought process by seeking everyone else's answers. Instead, we ask ourselves great questions about our specific context. Whereas experts know absolutes (what works in general or on average), investigators focus on evidence (what works in THIS situation). The executive joins the company and begins to implement her playbook or hire "her people" without understanding this new team whatsoever. The marketing team publishes list article after list article, bland piece after bland piece, because a famous brand or favorite expert or past moment of success suggests it's "the" approach. A friend bugs you for yet another round of feedback for this new project they're going to launch, they swear. A public speaker performs the exact same 45 minutes with every single speech. ...and more, oh so much more! In every case, these people build their work on a simple premise: "What worked there and then will work here and now." Simple, yet faulty. Whether knowingly or (far more likely) implicitly, they're Aristotelian in their approach to data. The data says X. That's the essence. That's the absolute. That's The Truth. Eric Siegel is a predictive analytics expert. While helping an airline brand figure out how to fill its flights more consistently, Eric noticed in the data that vegetarians missed fewer flights. Now, a busy executive or stressed-out marketer might stop there and say, “Great! The data has given us THE answer. We should market to vegetarians." Thinking more critically and creatively, however, Eric wondered, "Whydo vegetarians miss fewer flights?" (Funny how that pesky question of "why" always slips past us when we just stare at the data.) Why do vegetarians miss fewer flights? Does the essence of a vegetarian include punctuality? Well, just think: How did Eric identify these people as vegetarians in the first place? That's not written on their ID, right? The answer: They requested vegetarian meal options. Ah ha! It wasn't the fact that they're vegetarians that caused them to miss fewer flights. It was the fact that they personalized something about their experience! Whether because they were forced to spend more time with the brand, and thus it was top-of-mind, or because they were looking forward to their experience a bit more than the typical passenger, these people missed fewer flights. By trying to contextualize an absolute, Eric found a true insight -- an insight on which they could act. Thanks to Eric, they realized,We shouldn't launch a giant campaign to target vegetarians. We should get more people to personalize something about their flights. Which approach will you take? Data informs. It doesn't instruct. That's why the need to be data driven is slowly given way to a new phrase among my personal community of tech entrepreneurs: being data informed. That idea hasn't leaked out of the tech bubble much just yet, but I believe it's the better approach to data. I believe it's the Galilean approach, renamed. If we're data driven instead of data informed, if we're Aristotelian instead of Galilean, then we base our decisions on one fundamental assumption: Our context here and now is exactly like to another situation there and then. In reality, of course, it's not EXACTLY the same. It's ALMOST the same, and considering the differences makes all the difference in the world. We shouldn't make decisions by shrugging and saying, "Close enough." Because close enough leads to work that's "good enough." And "good enough" simply isn't enough ... for us. Join “Damn the Best Practices” and get one new idea each week to start off inspired and motivated. Check email to confirm and I’ll share a special something after. Posted on November 30, 2018 by Jay Acunzo.